Are you desperate for work? Thinking about going back to school or starting a business? Have you been downsized, fired, finished your military service or been ill? Do you have a physical, mental, or emotional disability? Too young or too old? Overqualified or underqualified? When you think about it, every job hunter is challenged. It’s just a matter of degree. 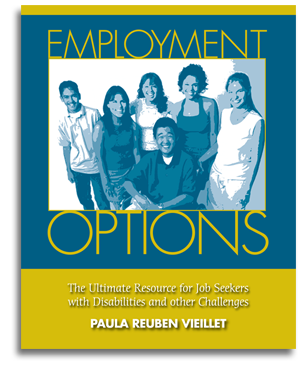 Employment Options: the Ultimate Resource for Job Seekers with Disabilities and other Challenges can help you find suitable work and get hired, even under the most challenging circumstances. With its visual approach, pictures, and easy-to-complete activities, this book is designed to accomodate persons with different learning styles without sacrificing content. You will learn how to properly fill out an application, honest and sensible ways to handle tough situations such as employment gaps, bad references, or a criminal record, how to stand up for your rights as a job hunter under federal laws, and how to craft a career-changing and job-specific resume that will get your phone ringing. Explore your skills, talents, and abilities in an interactive fashion. Get advice on how to choose your best career options BEFORE embarking into retraining, a new field, or a new job. Paula Reuben Vieillet is a Nationally Certified Vocational Evaluator, and President of Employment Options, Inc. a national “Ticket to Work” Employment Network.